“The Squirt” at Berowra Railway Station. How many of you have encountered railway stations with as much charm as this in Australia or around the world? Doesn’t Berowra Railway Station of yesteryear look proud of itself with its spotless platform, flower beds, palm trees, splendid lamp and water tank. In earlier times railway gardens vied with one another in inter-station competition! Our image also shows the little railmotor, in service before the electrification of the line. 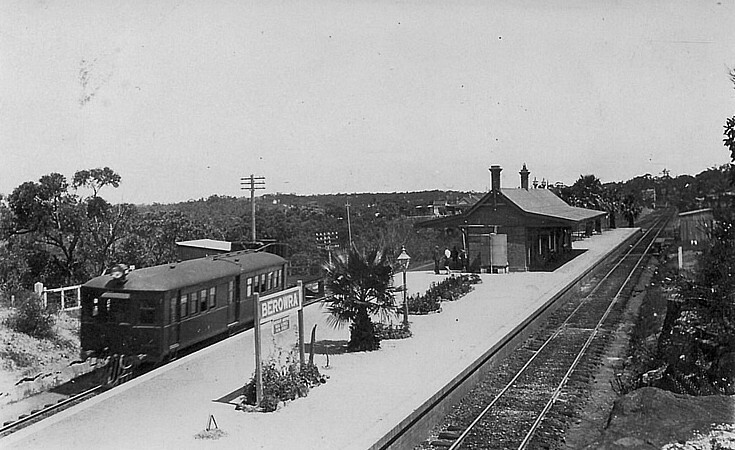 The railmotor carried passengers between Hornsby and Cowan and was known as “The Squirt” and “The Tin Hare”. With the increase in passenger numbers extra carriages were added. Berowra resident, Jim Hatfield has happy memories of railmotor journeys to and from school in Hornsby, in the early 40’s. Perhaps you have memories to share also. Do leave a comment or a question. What a great photo.Interesting to see the large house in the background. This photo reminds me of when I used to catch this “squirt” to Hornsby,from there ,I then caught a train to the city,where I worked.I had just been married ,and came from Hornsby to live here at Berowra,”You`re going out to the Sticks to live”,my family said to me.It was a beaut little train ,I thought, and I loved riding in it. Looking at the photo of the “Squirt” reminds me of going on it first to Asquith Primary school before attending the Hornsby Domestic School which was eventually burnt down by a bush fire in 1955. I remember one driver of the “Squirt” was a man by name of Mr Gaughan, who if he saw a child running to catch the train would wait but remind them to get up earlier so that they wouldn’t have to run to catch the train. In those days missing the train was no excuse for me to stay home from school as I was then allowed to walk along the railway line to Asquith since the next train wasn’t due until 10.30 am. The Squirt was sometimes replaced by a steam train before eventually the line was electrified and the Squirt disappeared. Is there anyone who remembers Mr Gaughan?